With providing the riches bass performance and slim size in mind, Volent's engineer once again designed best in class Chorale CL-2i 2.5 ways floorstanding loudspeaker for audiophile. Volent Twin Ribbon tweeter gives clear treble performance. 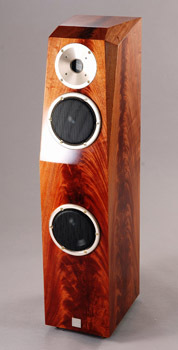 Volent's patented Twin-ribbon tweeter give finest treble with minimize phase error. all that gives Chorale CL-2i the best in class performance you can imagine. Vertical paced crossover gives clear bass performance. During bass performance, which trigger large amount of air movement within the enclosure. Volent special designed vertical placed crossover which minimize the crossover vibration during the bass performance which gives you the most clear and detail enjoyment. Dual 6 inches Hextech voice coil woofer gives CL-2i riches bass performance without scarifying details and sound field imagining abilities, for bass performance goes deep down to 35Hz. Chorale CL-2i can almost perform all kind of music perfectly.